Who would cross must answer me these questions three. Now what, you may well ask, is this? Well, it’s an interactive fiction. Yeah, that’s a real thing. An interactive fiction is a sort of fiction story you play, or maybe it’s a sort of interactive game you read. Think of it like a first-person shooter game where you have to use your imagination to see the splattered blood and hear the explosions. 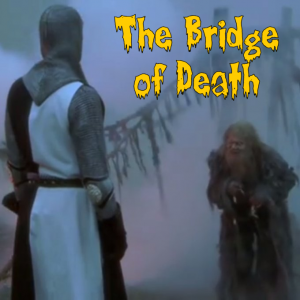 This particular interactive fiction is an adaptation of the Bridge of Death scene from Monty Python and the Holy Grail. It was created exclusively as a learning exercise. 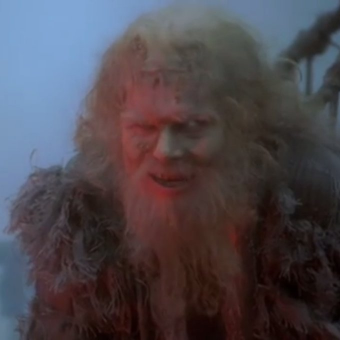 It takes about 5 to 10 minutes to play The Bridge of Death unless you spend a lot of time looking around, or you happen to get thrown into the Gorge of Eternal Peril (here’s a hint: DON’T PANIC). The Bridge of Death was created with Inform and has IFID 8DDFFC7D-C290-47AC-89B0-F67505F67E0C. To play a work like this one, you need an interpreter program: many are available, among them Zoom for Mac OS X and for Unix; Windows Frotz or Windows Glulxe for Windows. Scorpion, it appears the source is missing the statement that sets up the image. If you put the source in a Glulx project you need the line “Figure of Bridgekeeper is the file “bridgekeeper.png”.” somewhere. I have it on line 29. You also need the image in a “figures” folder in the project materials folder.